During Mental Health Awareness Week, Cllr Michael Lilley is calling on us all to consider kindness to ourselves and others as a first step to combat the reality of everyday stress of living. I am writing with the intention of highlighting Mental Health Awareness Week. This year’s theme highlights the stress in all our lives that triggers depression and anxiety. However, on the Isle of Wight there is a continuation of decline in our local mental health services. Another year has drifted by since IW Council signed up to the Local Authority Mental Health Challenge, a Mental Health Champion appointed, and a revised IW Health and Well-Being Board recommitted to its priority of seeing improvement in failed mental health services. The Care Quality Commission Report’s stating that mental health services on the Island were inadequate, the IW NHS Trust and Clinical Commission Group acknowledging failure, and the publishing of a new blueprint for IW Mental Health Services. However, Ryde East local residents and I have seen no real change. When are we going to see actions instead of well-meaning words and written statements outlining the dreams of change and real improvement in services. In the last year, I have been contacted by many Island residents who have reported that services are in fact reducing and becoming worse. I have observed a number of deaths that relate to deep unhappiness whilst either waiting help for services, receiving it or waiting for it. It has not been a case of people or their families not asking for help. A recent report has stated that the Isle of Wight has the highest number of children and young people who have been hospitalised or needed hospital treatment due to mental health disorders. This is extremely alarming as research tells us that 80% of adults with long-term mental health issues were identified with needs as a child. There seems to be a denial and lack of ownership of why so many Island children are unhappy and why they go onto being troubled and unhappy adults. We need to move away from diagnosis, labelling, the use of words like disorder, unnecessary medication and look at the issues that make us deeply unhappy. It seems the bureaucracy of criteria and rules of engagement with agencies has got in the way of simple day to day human kindness. We seem to have moved into a society of “Not my problem, you do not meet the threshold, your needs do not fit our funding and sorry I cannot help”, an austere society of closed doors. Where is the simple everyday kindness, that in fact is the cornerstone of any starting point of helping another human being on the road to recovery? 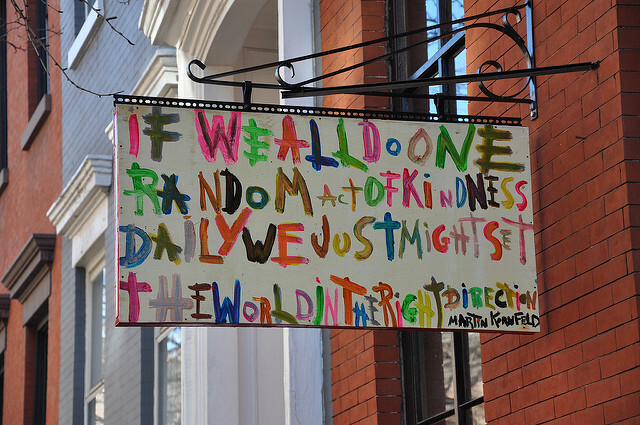 It seems the rules and risk adversity of many services simply crowd out everyday kindness and intuitive interactions. The Island voluntary sector has wonderful examples of everyday kindness that daily changes lives with simple acts of kindness and a cup of tea, just pop-in to Ryde Foodbank on a Tuesday or Thursday. During Mental Health Awareness Week, I will be calling on every citizen to consider kindness and the kindness to ourselves and others as a first step to combat the reality of everyday stress of living in 2018. I will be wearing my Green Ribbon ( a sign symbolising Good Mental Health for All) as a symbol of my commitment to humanise the issue of mental health distress and stigma. 3 Comments on "Letter: Let’s celebrate kindness to overcome stress"
It costs absolutely nothing to be pleasant to others and such a simple act can do so much to relieve the stresses felt by so many – well said Cllr Lilley. Well said Michael. As my father used to tell me when I was growing up – kind words are coupon free! There are too many aggressive people around trying to bully others. If only they stopped to show a little kindness, they too would feel better.